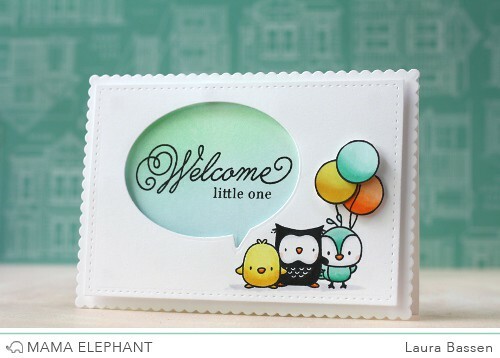 mama elephant | design blog: Index Card CC with Laura! Index Card CC with Laura! Hi everyone! Laura Bassen here again, sharing a project featuring the new Index Card - Creative Cuts. 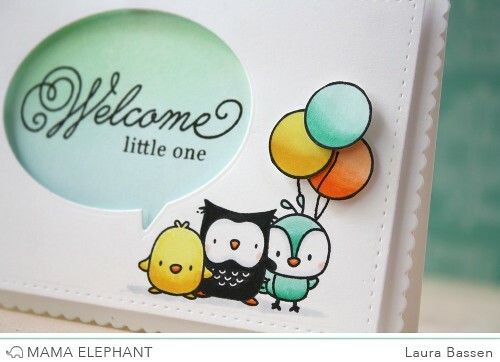 This die set allows you to create the cutest little A1 size cards. I love this size. The speech bubble is also included in the set. After creating a speech bubble window, I blended in some soft ink on the card base, and popped the card front up with foam tape. I used a bit of masking to huddle the cute critters from the Just Hatched stamp set and then colored them with Copics. In my mind, I pictured these cute little critters visiting a newborn baby in the hospital, and they wanted to bring the baby some balloons. (Just go with it, lol.) So, I popped up a few balloons using the circle image from the Pandamonium stamp set and drew a few balloon strings. Super easy, cute and perfect for baby. That's all for today! Thanks so much for stopping by! Hee hee! That's so cute! The little creatures visiting the baby in the hospital - love it! OK, so that die set IS a different size & shape than the Basic set ones. I've always wondered that (I wish ME would put the dimensions on their info). Love it, Laura! Such a darling card! I'm really loving this size card and speech bubble, too! Ooooh, this is so sweet!!! Love it! Ohhh! It's just adorable. I love the font in this set. I always adore Laura's work! They always makes me smile and feel happy. Love it! Your work is always wonderful and I love the way your mind works you have a back story for every card lol l just love you and all your work!